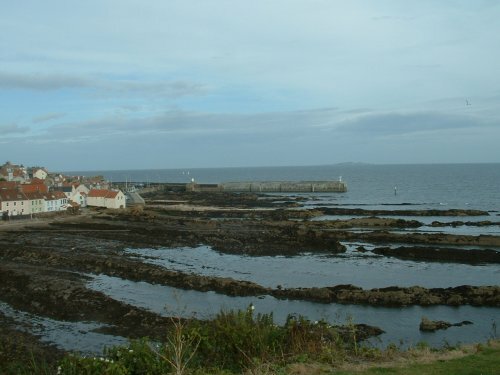 Simply find the village of Pittenweem on the east neuk road and head for the harbour which is well signposted. In the harbour area there is various street parking but some areas are reserved for commercial fishermen's parking monday to friday. Just follow the notices and you'll be fine. The pier you're looking for is the Lighthouse Pier which is to your immediate left when you come down the hill to the harbour. Go all the way out that pier onto the concrete breakwater. In this picture above you can see how the breakwater extends about 100 yards out from the end of the old lighthouse pier.This extension was added to the pier about 15 years ago and is a very good fishing mark.It's also very safe and quite suitable for youngsters under supervision as there are plenty fish right down the sides to keep the kids happy. 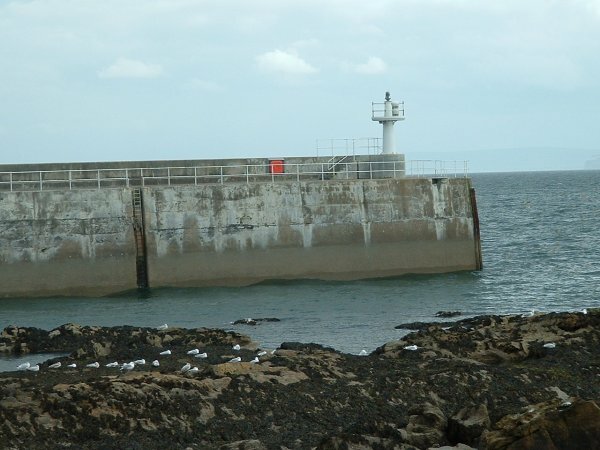 Breakwater from Mid Shore showing lifebelt mark. Almost anywhere on this pier will produce fish in the summer,from coley and flounders on the 'inside' to good numbers or red cod,wrasse and coley 'over the back' towards the sea. In my experience the top mark here is fishing over the back at the lifebelt shown in the picture.9 days out of 10 it will outfish the very point of the pier,but,as always,there are exceptions and only by casting about will you find the best spot for you on the day.From june to august bags in the teens of cod and wrasse are highly likely,tailing off as the summer passes.High spring tides are best,although calm conditions at any time and tide should produce fish.Your best bet is to arrive here at low water and have a good look at the lie of the ground and memorise the top spots in the gaps in the weed.A few yards off can make a huge difference here. For the kids,try the Oiltank Pier,which is self explanitory when you see it, in the cut mouth for bags of small summer coley. As a winter mark it's not great,as the ground is pretty hard and winds and waves will have you tying up all day.